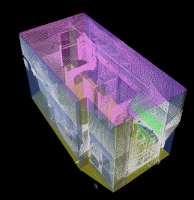 In this project, we are investigating context-based recognition methods for identifying core building components within 3D sensor data of building interiors. Specifically, we consider walls, floors, ceilings, windows, doors, and doorways. In many cases, it is difficult to distinguish similar-looking components based on the components alone. A window looks much like a doorway, and a table has similar geometry to a floor. We believe that such ambiguous objects can be more easily recognized by considering the context of the objects. For example, a doorway is more likely to be located near the floor, and a floor is usually adjacent to a wall at the bottom, while a table is not. These types of contextual relationships can be represented and reasoned about using machine learning techniques. Our initial results indicate that the methods work well for recognizing walls, floors, and ceilings, and we are beginning to look at how windows, doors, and doorways can be incorporated into the framework. This project is funded in part, by the National Science Foundation (CMMI-0856558) and by the Pennsylvania Infrastructure Technology Alliance.